Notes: - NB Posted on 14th October 1997 - not first day. 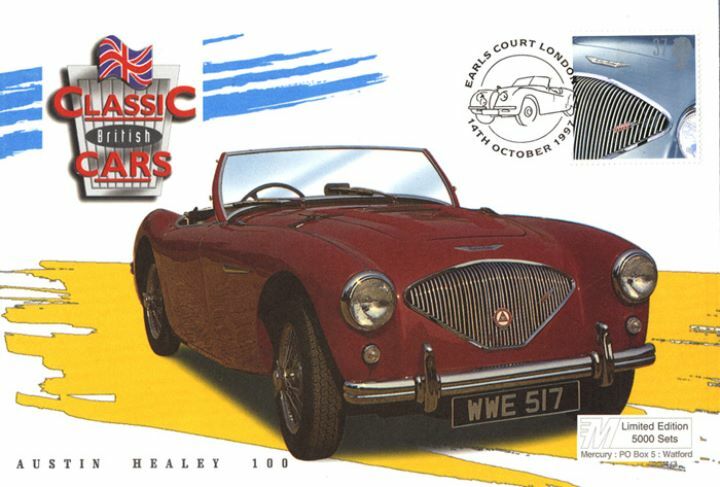 The above Royal Mail Classic Cars stamps were issued on 01 October 1996 by Royal Mail and feature the following stamp designs: 20p Triumph TR3; 26p MG TD; 37p Austin Healey 100; 43p Jaguar XK120; 63p Morgan plus 4. The Austin Healey 100 first day cover with the Earl's Court, Jaguar, Special Handstamp postmark has been produced by Westminster and features these stamps which can make a very collectible and lovely gift.